Last summer, we celebrated the 50th anniversary of the debut of Spider-Man. Today marks the 50th anniversary of the debut of Spider-Man … err, Doctor Octopus, aka, the SUPERIOR Spider-Man. 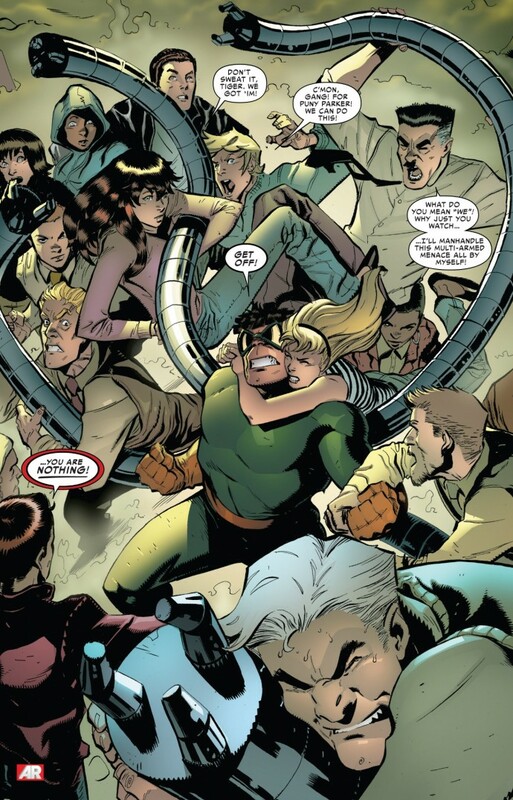 In honor of the anniversary of Amazing Spider-Man #3’s release, I thought I’d put together a list of Doc Ock’s 10 “greatest moments.” What constitutes a great moment, you ask? Well, besides personal preference, I took into account long-term impact on both Otto and Spidey. So while these may not be the 10 greatest Doc Ock/Spider-Man stories, I would argue that they’re the most significant. The mid-90s were a dark time for Spider-Man comics, but I remember the “Web of Death” arc being a fun one when I first read it in 1994/95. In a moment that completely embodies the arrogance of Otto Octavius, he saves his arch-nemesis Spider-Man from a mysterious virus, but only because he wants to keep him alive long enough to “continue their dance” and keep fighting as adversaries. Of course, the mysterious clone Kaine would have something to say with that and shockingly kills Doc Ock at issues end (in a moment that will be revisited next month in the pages of Superior Spider-Man Team-Up and Scarlet Spider). I’ve always found this arc to be the height of Bronze Age silliness, but heck, this is a list about Doc Ock’s most memorable moments, and Otto ALMOST successfully marrying Peter’s Aunt May has to count for something. I never truly understood how May thought Spider-Man was a menace, but Otto was such a nice man despite having spent numerous stints in prison. 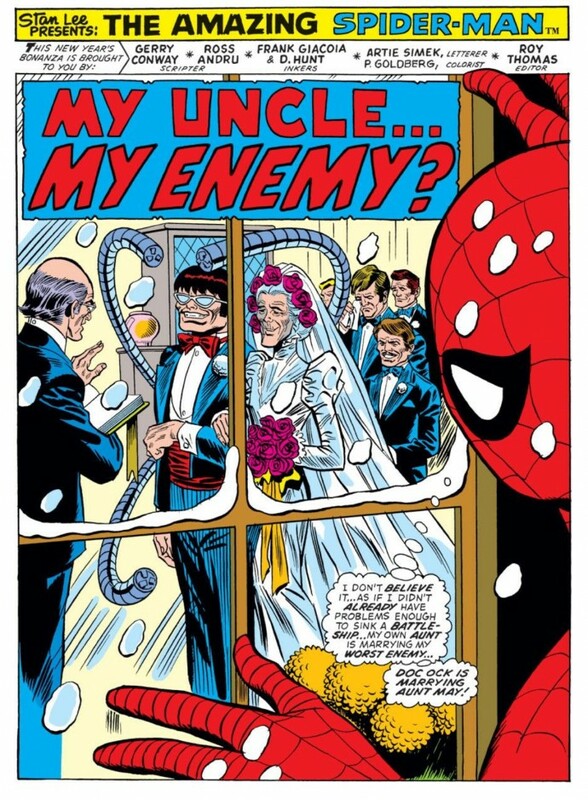 Of course, Doc Ock only wanted to marry May for access to a nuclear reactor on an island she unknowingly inherited (in another silly plot contrivance). In recent years, especially under current Spidey scribe Dan Slott, Otto’s romance with May is portrayed as being sincere. 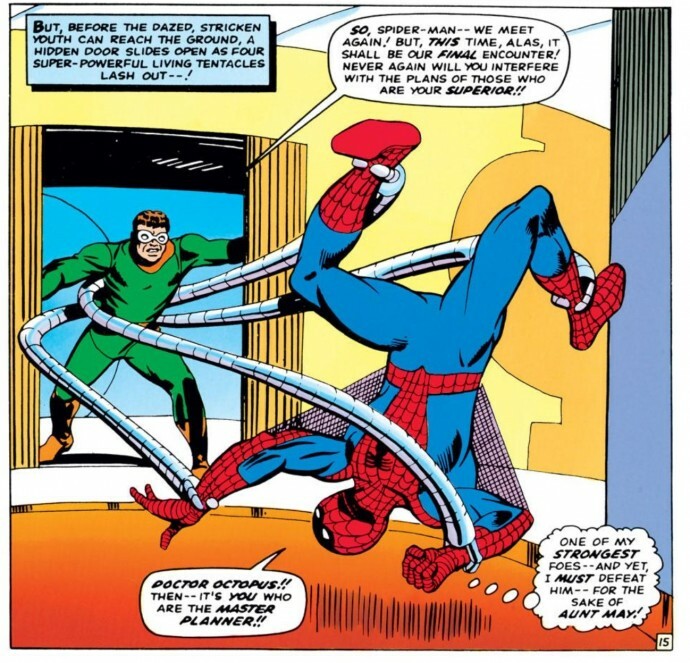 During the Silver Age, Doctor Octopus was always portrayed as a formidable foe at the center of the majority of the major moments in Peter Parker/Spider-Man’s life. In this arc, Doc Ock uses a weapon called a “nullifier” on Spider-Man, making him an amnesiac. 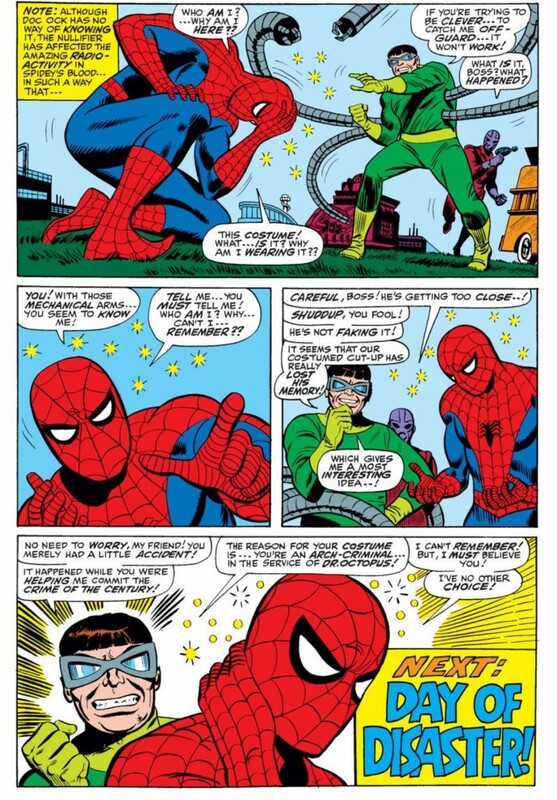 He then convinces his mortal enemy that he is helping him “commit the crime of the century.” This move really screws with Peter’s personal life, as the amnesia continues for a few issues right as he’s starting to put the moves on the lovely Gwen Stacy. 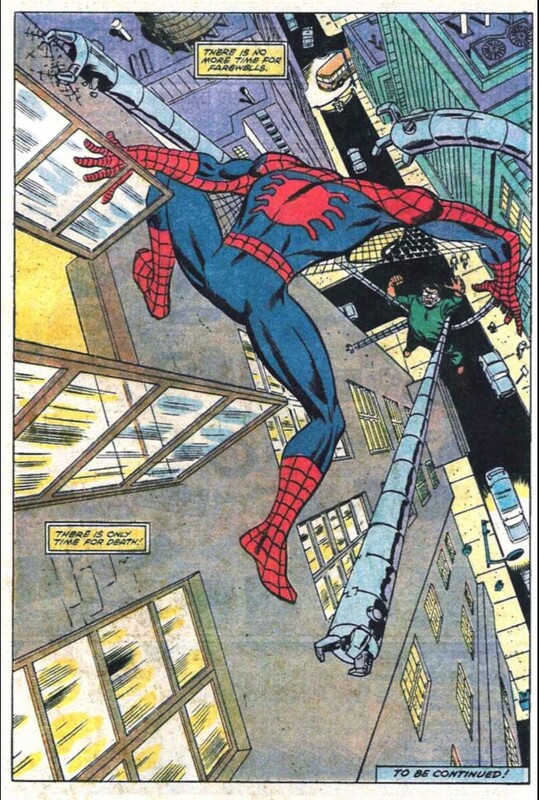 Image from Amazing Spider-Man #90: Stan Lee, Gil Kane & John Romita Sr. Speaking of Doc Ock always being there for major moments of Spidey’s life, this one rooftop battle would go on to haunt Spider-Man for the rest of his life. Just as Spidey seems to be getting the upper hand on Otto, Doc Ock’s mechanical arms crash into the side of the building, causing them to crumble and fall to the ground below. Police Captain George Stacy, Gwen’s father, is there to push a little boy out of harm’s way, and gets killed instead. Sure, this wasn’t the way Doc Ock planned it, but I’m sure he took glee in knowing how much he tortured Spider-Man by being involved in Stacy’s death. The event created a fracture in Peter and Gwen’s romance that never fully healed before her untimely death in ASM #121. More personally, Peter experienced the tragic loss of another formative father figure to go along with the deaths of his own father and Uncle Ben. My list’s first “Superior” era entry shows Otto at both his best and most diabolical. Just as he’s starting to embrace the heroic qualities of being Spider-Man, Otto discovers that a piece of Peter’s mind still exists in his brain patterns. Rather than let the two co-exist, Otto calls for a “Parker-echtomy” to remove him completely. 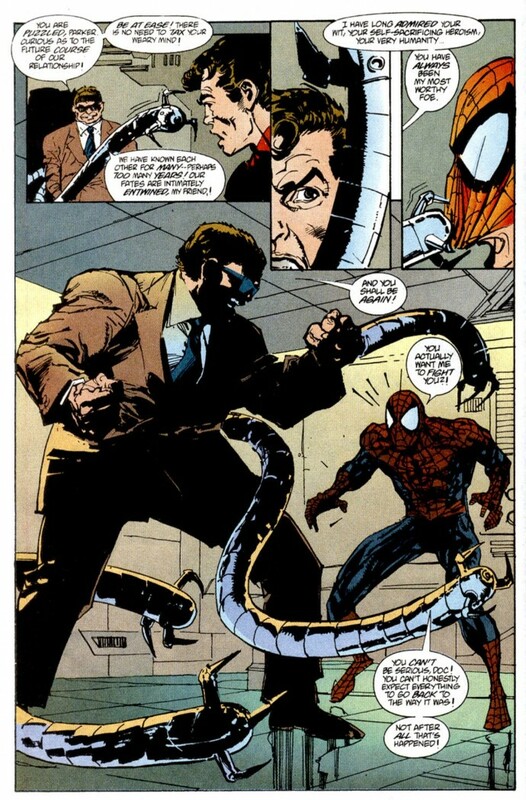 What follows is one of the better Spider-Man/Doctor Octopus battles to ever take place – inside Peter’s “mindscape.” And after always managing to physical succumb to Spider-Man in the past, Otto shows he has learned a thing or two about being Peter and uses the hero’s biggest personal weakness against him: his guilt about failing others. By forcing Peter to admit that he almost interfered in life-saving surgery of a little girl in an act of self-preservation, Otto beats Spider-Man into submission, and we haven’t caught a glimpse of Parker since. 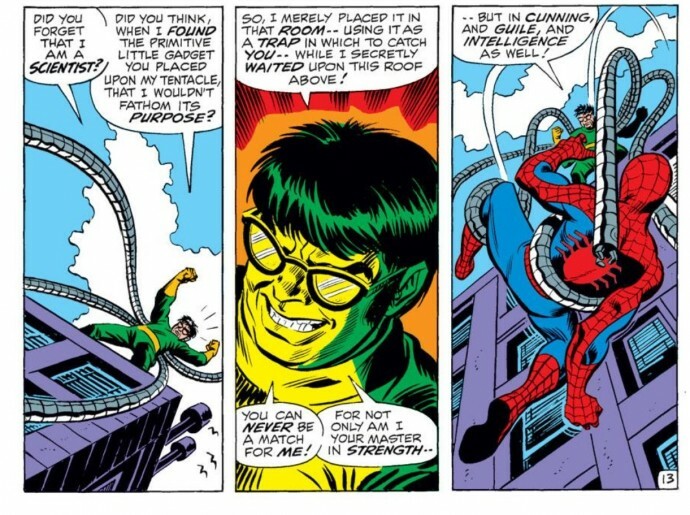 Doc Ock’s first impression is a lasting one as he manages to defeat Spider-Man and smack him around dismissively. The humiliation almost causes Peter to quit being Spidey until a pep talk from Johnny Storm makes him reconsider. 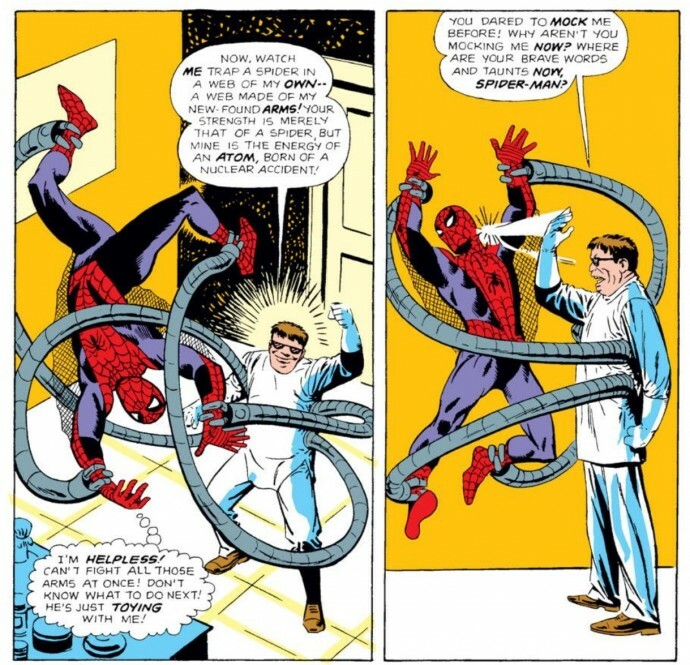 But make no mistake, in this memorable first appearance, Doc Ock was built as Spider-Man’s arch-foe. Readers also got to see from the very beginning what an insufferable jerk Otto was, a characteristic he would maintain for the duration of his criminal (and now heroic) career. The moment that broke the internet, and brought out the worst in Spider-Man fans as they threatened the life of ASM-writer Dan Slott is hands down, the most memorable moment involving Doc Ock. I understand that ASM #698 is still too new to be put on a pedestal with the likes of “If this Be My Destiny” and the “Death of Captain Stacy,” but it undoubtedly captures Otto’s ultimate victory over his long-time adversary, as well as changed the course of events for Spider-Man in a way readers haven’t seen since the days of the “Clone Saga.” And while I’ve come to revile the “Clone Saga” all these years later, I feel like Slott has really brought his “A” game to Superior Spider-Man. Slott’s work remains polarizing, and I’m certain my choice is controversial … but I’m also sure if we asked Otto Octavius himself, he would agree with my selection. Personally I would have put the Master Planner saga as #1. Love the blog. I look forward to reading your articles, gives me my fix when I don’t have the extra money lying around to continue my own hunt. Master Planner is probably the greatest “story” that Doc Ock has been involved with. Probably my personal favorite of the ones on this list. But I went with 698 since it came to represent Otto’s ultimate victory, while ASM #31-33 is more about Peter coming to terms with being Spider-Man and never giving up. No An Obituary For Octopus?